Welcome To Vernal Magazine's Blog: Did the Beckhams make the right call with Romeo's Modelling Career? Did the Beckhams make the right call with Romeo's Modelling Career? Here is Daily Mail's Sandra Parson's opinion on the David and Victoria's Beckham's decision. "Most women I know think David Beckham’s wonderful. Most men, on the other hand, don’t. They dismiss him as a thick, jumped-up footballer of fading talent and think the reason women like him is because we’re easily fooled. They’re wrong, of course. I admit the six-pack and the chiselled cheekbones are an enjoyable bonus, but they’re not what women find most attractive about him. 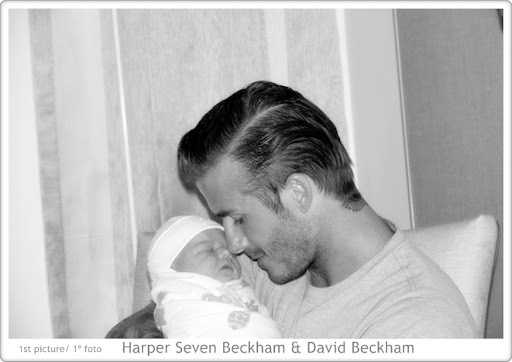 No, the real reason most women like David Beckham, I suspect, is because he’s so obviously a very devoted father. Whether he’s crying over baby Harper (‘I can’t even look at her without welling up,’ he confessed shortly after her birth), playfully hurling his boys into the Malibu surf or giving them affectionate hugs at a baseball game, everything about him suggests he puts his family first. And although his wife Posh infuriates us — too thin, too pouty, and anyway, why on earth does she always look so miserable when she’s got the world?— I have grudgingly to admit to admiring her, too. The fact is that despite the £14 million Beverly Hills mansion, the £200 million in the bank, the jet-set travel and the international fame, she and her husband appear to have pulled off the remarkable feat of raising their offspring to be polite, well-behaved and not obviously spoiled. Which is what makes yesterday’s news about Romeo Beckham so dismaying. 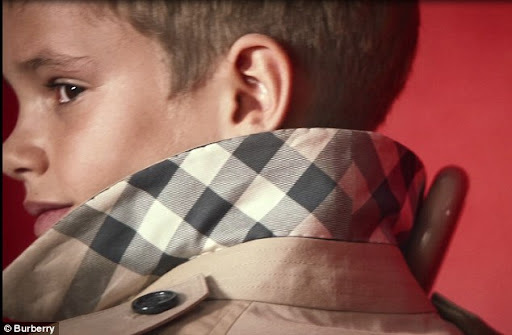 What were his parents thinking, to allow him to model in Burberry’s latest ad campaign? By putting their ten-year-old son so firmly in the spotlight, they’ve made a terrible mistake. For Romeo, any last semblance of normality ended the minute that campaign went public yesterday. The footage shows him pulling up the collar on his trenchcoat, striking a provocative pose with his umbrella and smiling for his close-up like someone who’s had an Equity card for 20 years. No doubt the Beckhams will say it was Romeo’s choice to take part, and he certainly looks as though he’s having fun. But they should still have firmly turned down his first modelling job. Because from now on he becomes not just another well-behaved, good-looking Beckham child, but a public personality with all the attention and demands that entails. Perhaps the Beckhams, who after all move in a world in which modelling high-fashion brands is an everyday event, think they can control what happens next. But unless they ban Romeo from doing any more shoots until he’s at least 18, they’re deluding themselves. It’s hard to think of any child for whom stardom has been an unmitigated success. Romeo’s cheeky grin and high cheekbones remind me uncomfortably of Macaulay Culkin, whose performance in Home Alone at the age of ten was little short of brilliant. 22 years later, he is almost unrecognisable as he shuffles around New York, a shell of a man wrecked by drugs and drink. Patsy Kensit, Lindsay Lohan, Kate Moss, Drew Barrymore, Daniel Radcliffe ... all began their careers young and all have struggled, with varying degrees of success, to overcome the difficulties of a childhood distorted by celebrity. How can he learn to become a grounded adult, able to cope with life’s inevitable difficulties, if he’s been admired from the age of ten for nothing more than wearing stylish clothes? Of course, it’s perfectly understandable why he was so keen to become a model. Like many sons, he wants to emulate his father. But does David Beckham really want Romeo to believe that all you need to succeed in life are famous parents and an attractive face? Whether you like or despise the Beckhams, what’s undeniable is that they have made their fortunes not through family money or connections, but through a mixture of sheer determination and hard work. The best thing they can do for the four children they clearly adore is to allow them to do the same."